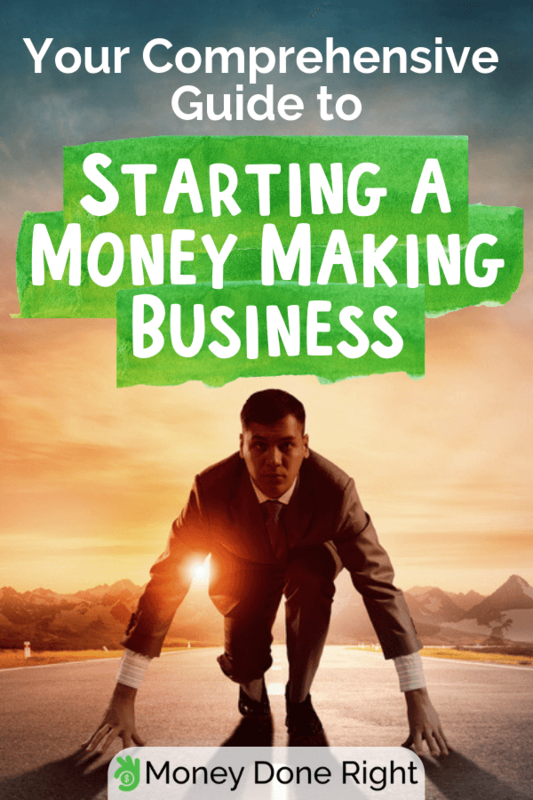 Would you like to start a money making business but you have no idea where to begin and how to do it? I know you’re worried and unsure if this is a good idea, but you shouldn’t be. On one hand, many others did it and there is no reason why you couldn’t. On the other hand, I am here to help and guide your steps. Before we move on to the actual steps to starting a money making business, I believe it is important that you know a few things about the market you’re trying to conquer. Click here for 100+ amazing ideas on how to make extra money. Nonemployer businesses dominate the U.S. business environment. They represent 2% of all businesses, according to the U.S. Census Bureau, and 81% of small businesses, according the 2018 Small Business Credit Survey on Nonemployer Firms. Many small businesses were started as home-based businesses meant to facilitate the earning of supplemental income. According to the same 2018 survey cited above, 69% of nonemployer businesses are home-operated and 36% of them are a source of supplemental income for their owners. Poor and bad credit was the top obstacle for entrepreneurs trying to finance their business plans. Most of them used personal assets and guarantees as collaterals for their loans, and 65% financed their businesses with personal credit cards. What does this tell you? It doesn’t matter if you’re broke, unemployed, or looking for a way to earn more money, if you’re starting a roofing business or trying your luck online, if you’ll setup your office downtown or at home, you can do it. To increase your chances even more, you should start early and not rush through the process. You should plan everything ahead, secure the necessary financing, and ensure you can actually make money. There are a few simple steps you should follow, and we will detail them in the following lines. They apply to all businesses, no matter their specific, so you cannot go wrong following them. Would you like to start your money-making business investing less than $100 in Essentials? Read our guide on starting a business without money here! Remember the above obstacle most entrepreneurs encountered when starting their business? I suggest you eliminate it by finding out your exact credit score and working to improve it. Even if you won’t need financing for your business, a good credit score will make you more trustworthy for landlords should you need to rent a space for your business. It will also guarantee you access to the best loan offers and credit cards. Not only that you will be paying low interest rates, but you will benefit from numerous and valuable credit card perks. You can easily check your credit score with CreditSesame or Credit Karma. Once you know where you stand, you can take measures to improve it and monitor the results of your efforts. Do you have poor or bad credit? Discover 17 Unbeatable Ways to Improve Your Credit Score in No Time here! While you work to improve your credit score, you should also start to save money and earn money. This way, when the time comes to actually start your money making business, you will have the means to finance it. Use Uber or Lyft instead of a taxicab. Click here to learn how I saved $600 on Uber rides! Download the free Shopkick app on your smartphone. This app pays you just for walking into stores! Read our full Shopkick review here. Use coupons and discount codes when shopping. You can save up to 50% on your shopping with Butterfly Saves Target and Walmart coupons. Start using Butterfly Saves now! Do your shopping through cashback websites. There are websites like Ebates and Affinityy that let you shop at your favorite stores and receive up to 20% cashback on your purchases. Click here to sign up for Ebates and receive a $10 bonus! Negotiate lower bills. There are ways to lower your utility payments and put money aside for your business plans. For example, you can let BillHunters negotiate with your utilities providers. Click here to find out how they can help! Use Ibotta when shopping at local stores. You’ll receive cashback on your everyday purchases, even on groceries. If you sign up through this link, you’ll get a $10 bonus. Use GetUpside when fueling your car. If you need to drive, make sure you get cashback on the money you spend on gas. Download the app, use WFM8U as a referral code, and earn a $0.2/gallon bonus! Take advantage of your credit card perks. Your credit cards offer benefits you probably didn’t know about. You should learn to make the most of them. Click here to discover some hidden credit card perks! Buy in bulk. This way, you will have access to lower prices. Check out our list of 31 household items you should buy in bulk to save money! Collect the change and invest it. Those few cents you never pay attention to when you make payments could be a real treasure. There are apps that round up your payments and invest the change, helping you save and earn for retirement or whatever projects you have in mind, in this case, starting your own money-making business. For more details, check out our reviews of Acorns and Cushion. Get paid to boost your health. There is nothing better than getting rewarded for boosting your health. For example Sweatcoin pays you to walk, while HealthyWage pays you to lose weight. Earn real money playing games. It can’t get better than that, can it? You have fun and make money, all at the same time. With Long Game, you earn rewards for saving money and play slots with real cash prices. With SwagIQ, you earn rewards for playing Trivia. Earn money watching videos, browsing the web, or taking surveys. For more details on things you can do online to make money, check out Swagbucks, SurveyJunkie, and InboxDollars. Sell the stuff you no longer need. It is a good way to free up space and earn some extra money. To make the most of your old stuff, consider using apps that help you sell your stuff fast, like Decluttr. Check out our list of 17 Best Money Making Apps of 2019! If these solutions are not enough to secure the financing you need for your business, you should use Credit Karma to identify the best loan offers, or CreditCards.com if you prefer credit cards. Are you starting your business on the side of your existing job, to make some extra money or pursue a passion? Is your business going to be your one and only source of income? Many people underestimate it but my honest advice is that if you’re going to invest time, money, and effort into a business, it should be in a field you’re interested, passionate about. Perhaps your main goal is to make money, but it doesn’t have to exclude your interests and passions. On the contrary, you should aim to make money while pursuing your interests and hobbies. You should start your business in a field you know really well or are genuinely interested in learning about. You cannot afford to leave things to chance or hire experts, so evaluate your options carefully and settle for what you know best or are dying to discover. Some people have great dreams but no means to turn them into reality. You should be realistic when deciding on the type of business to start and make sure you have the necessary resources. To find out whether your business idea is practical, think of what starting it would involve in terms of cash, space, equipment, personnel, monetization, etc. Can you really cover everything? I know a general contractor whose greatest dream was to produce building studs. His business plan was brilliant and the man really knew what he was doing. Unfortunately, he needed an initial investment of nearly half a million that he wasn’t able to secure. After almost two years of looking up suppliers and trying to obtain financing and failing, he ended up opening a restaurant. You can start a money making business without investing a fortune. You just need to find something you’re good at and which doesn’t require a huge initial investment. Before you fixate on a specific business idea, you should study the market and make sure there is demand for the products or services you are going to offer. You should study the competition to know exactly what you’re up against and find something that could get you the upper hand. Some entrepreneurs see their business as a hobby, something they do when and if they have time. Others make their business a priority and dedicate all their time and energy to make it work. Before you take the path of starting a money making business, you need to decide how far you want to go, how much time you are willing to put in, and whom you can count on. Would you like to start with a small investment and keep your current job at least until you start making money? You surely have some ideas on the type of business you would like to start. If not, perhaps you’ll find one of the following money making business ideas worth trying. All you need is a car and a driving license, which you probably have, so you can start making money right away. Did you know that after 100 drives with Lyft you can get a $300 bonus? Click here to learn all about the benefits of driving for Lyft and Uber! If you have a room you’re not using or, better yet, a house or an apartment, you can rent it by the day through Airbnb. Read our guide on becoming an Airbnb host here! Depending on your area of expertise and qualifications, you could offer accounting, writing, graphic design, marketing, constructions, interior design, landscaping, or coaching, to name just a few. Follow this link to find out how you can earn money coaching! It means setting up an online store in which you list products you like or consider easy to sell. You pay the seller/manufacturer the wholesale price, and they ship the product to your buyer. Click here to learn how to build your dropshipping business in 5 easy steps! Affiliate marketing means generating sales or leads for a merchant in exchange for a commission. For example, you could review and promote your favorite Amazon products. Read our post on how you can make money as an Amazon affiliate in 2019 here! If you like to write and you think others would be interesting in reading your ideas, you should start blogging. You could make money from advertising, affiliate marketing, selling digital products, and more. Click here to learn how to start a blog! As an Avon rep, you’ll save money on products you’re already using, receive other products for free, and earn commissions on the sales you and the people you sign up make. Read our ultimate guide on becoming an Avon representative in 2019 here! The list could continue, but you should already have an idea on what you would like to do, so it is time to move on to the next step. Before you invest any time, money, and effort into your business idea, you should perform a competitive analysis. I am a fan of the SWOTT analysis, which involves reviewing Strengths, Weaknesses, Opportunities, Threats, and Trends in your business idea by itself and reported to other competing businesses. The purpose of this analysis is to evaluate your business potential business and, hopefully, learn to exploit its strengths, eliminate its weaknesses, identify new opportunities, mitigate threats, and anticipate and follow trends, so as to stand out among your competitors. If the weaknesses and threats exceed the strengths and opportunities, you should probably look for a new business idea. Do you need more business ideas? Here are 81 ideas for online businesses you can start from the comfort of your home! Starting a money making business is easier said than done. It could involve following complicated procedures that take time and paperwork. You may need various authorizations or licenses, subject to strict formalities. It is very important to write everything down, make a plan, and stick to it. Otherwise, you risk making mistakes, getting distracted from your goals, or forgetting important details. Where and how can you do that? Will you base your business at home or in a rented space? What are you going to sell and how? How much will you charge for your products/services? Will you be offering any guarantees? How will you advertise them? What are the initial investments and how will you cover them? You need to have everything thoroughly planned, and not just in general lines. You have to be practical and to the point, to know exactly what you have to do next and when you should do it. Be realistic and accept that not everything will work out like magic. You will encounter some obstacles, have people tell you that you’ll fail, or get at your wits end trying to find your way through bureaucracy. I’ve had my share of crazy days when starting this blog and trying to figure out my way on the personal finance market. I kept trying until I succeeded, and you should do the same. Hang in there and don’t give up! If you need inspiration, look at us. We started under a different blog name that we were forced to give up because it was trademarked. And, although we’re now making over $30,000, it wasn’t always like that. I know: you wanted to start a money making business. However, no business is going to make you a fortune from the beginning. You have to be realistic about your expectations. Besides, it’s better to work hard, have low expectations, and be presently surprised, than to expect miracles and be disappointed, don’t you think? Remember the SWOTT analysis recommended above. It covered trends, and you should keep up with them throughout the life of your business. Your goal should be to always offer better products, prices, or services than your competition, and to anticipate and meet your clients’ needs before they even acknowledge them. Just as we keep testing money-saving and money-making tools and ideas, you should stay up to date with any technology and strategies related to your line of business. And when you think you have nothing left to learn in that field, you can always learn to secure the largest tax refund or boost your retirement savings. Click here to discover 15 ways to secure a faster and worries-free retirement! If you want your business to thrive, you have to invest in it continuously, to strive to make it better. You have to monitor your efforts and their results, to see which ones were most effective, and you have to collect and use client feedback to guide your actions. There are many opportunities out there but it is up to you to identify and take advantage of them. If you’re starting a complex business, you may need CPA services. It it’s something simpler, the least you can do is use a personal finance tool like Personal Capital. It will help you track your earnings and expenses and see how you’re doing against your budget. You wouldn’t want to wake up to the cruel reality of spending more than you earn or owing more than you can afford to pay. For more information on Personal Capital, check out this post! With time, new equipment and technologies will emerge. They may ease various operations, ensure better results, or both. You should keep up and invest in them early, as they will help you grow and improve your business. Besides earning you time and getting you better results, they will make you look better in front of your customers. But don’t invest only in your business. I don’t know about you but my plan is to retire as soon as possible, or to start living a different life, where I have money to spend without necessarily working for it. If you’re anywhere near me on that, you should consider making small investments on the side. You’ll have something to rely on if things don’t work out or you come up with some other money making business ideas. There are many ways to invest profitably and with minimum risks. For ideas and information, see our posts on Acorns, Fundrise, Aspiration, Betterment, WealthSimple, and real estate investments! I hate to break this to you but no matter the specific of your money making business, you’ll have to file and pay taxes. To calculate and file them correctly, you should start tracking your income and expenses early. Your goal is to deduct as many expenses as possible and pay the lowest taxes or, better yet, earn a huge tax return. I’ve already covered deductions in this post. To make sure you benefit from all of them, monitor your income and expenses, and file them with ease, I recommend using Hurdlr. It is a smart app that will help you organize your information and supporting documents with ease and will take the guesswork out of the tax-filing process. Read more about Hurdlr and the benefits of using it here! It doesn’t matter how young you are, it is never too early to start saving for your retirement. You should have and contribute to your 401(k) and IRA accounts on a regular basis. Every dollar you deposit is another day without worries when you retire. To help grow your savings and make sure your retirement will be worries-free, I strongly recommend Blooom. It is the easiest way to secure expert management and consistent growth of your retirement savings account. Click here to learn more about Blooom and discover how it can help your retirement plans! No one wants to think about what may happen but isn’t it better to be safe than sorry? I’d want to know what will happen to my business, my home, my assets, and my (hopefully non-existent) debts. If you’re anything like me, I suggest you take control. It is quite easy, if you know what you’re doing. I recommend Trust & Will, as it helps you create your own legally valid Estate Plan within minutes and even appoint guardianships. If you later change your mind, all you have to do is log in to your account and make the necessary changes. Follow this link to learn more about and start using Trust & Will! So there you have it: your simple recipe to start a money making business from scratch, with minimum investments and risks. At this point, you should have your own successful business, everything under control, and a sound plan for retirement. What should you do next? We’ve already covered investments, so this is not some unrealistic, shallow recommendation. You’ve worked hard to get to this point, you still work hard every day, so you deserve a break every now and then. You deserve family vacations, shopping sprees, trips to places you love or never got to visit until now, experiences you will never forget. What’s the use of owning and running a money making business if you don’t enjoy the results of your work? The very reason why I got into personal finance blogging and quit my full-time job was to be able to afford and take time off to travel and enjoy life. This should be your goal too, not your money making business in itself. Life is short, so it is important that we live it to the fullest, that we make the most of every day and every single moment. I hope you’ll start doing that as soon as possible, and until then, I wish you the best of luck starting and running your money making business! As you get to it, don’t hesitate to leave a comment and share your money making business ideas, progress and, hopefully, success! Looking for even more tips and suggestions on how to save more money? Check out our comprehensive list here!